The Ph.D.-12™ Phage Display Peptide Library Kit contains a tube of the Ph.D.-12 Phage Library, protein reagents for a control reaction and sequencing primer stocks. The Ph.D.-12 library is a combinatorial library of random 12-mer peptides fused to a minor coat protein (pIII) of M13 phage. The displayed peptide is expressed at the N-terminus of pIII. The library consists of approximately 109 electroporated (i.e., unique) sequences. The Ph.D.-12 Phage Display Peptide Library is based on a combinatorial library of random dodecapeptides fused to a minor coat protein (pIII) of M13 phage (1–6). The displayed peptide (12-mer) is expressed at the N-terminus of pIII, i.e., the first residue of the mature protein is the first randomized position. 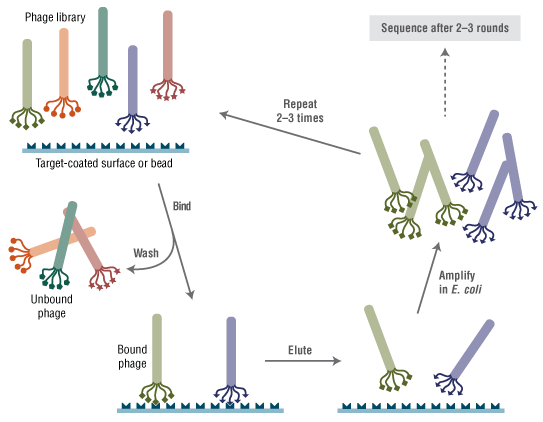 The peptide is followed by a short spacer (Gly-Gly-Gly-Ser) and then the wild-type pIII sequence. The library consists of approximately 109 electroporated sequences amplified once to yield approximately 100 copies of each sequence in 10 µl of the supplied phage. Panning with a pentavalent peptide library displayed on pIII. Sidhu, S.S. et al. (2003). Chembiochem. 4, 14-25. Azzazy, H.M. and Highsmith, W.E. (2002). Clin. Biochem.. 35, 425-445. Rodi, D.J. et al. (2002). Curr. Opin. Chem. Biol.. 6, 92-96. Parmley, S.F. and Smith, G.P. (1988). Gene. 73, 305-318. Berggard, T. et al. (2002). J. Biol. Chem.. 277, 41954-41959. Chen, L. and Sigler, P.B. (1999). Cell. 99, 757-769. Ferrer, M. and Harrison, S.C. (1999). J. Virol.. 73, 5795-5802. Biorn, A.C. et al. (2004). Biochemistry. 43, 1928-1938. Ferrer, M. et al. (1999). J. Pept. Res.. 54, 32-42. BouHamdan, M. et al. (1998). J. Biol. Chem.. 273, 8009-8016. Whaley, S.R. et al. (2000). Nature. 405, 665-668. Rozinov, M.N. and Nolan, G.P. (1998). Chem. Biol.. 5, 713-728. Rodi, D.J. et al. (1999). J. Mol. Biol.. 285, 197-203. Kraft, S. et al. (1999). J. Biol. Chem.. 274, 1979-1985. Koolpe, M. et al. (2002). J. Biol. Chem.. 277, 46974-46979. Mummert, M.E. et al. (2000). J. Exp. Med.. 192, 769-779. Hetian, L. et al. (2002). J. Biol. Chem.. 277, 43137-43142. White, S.J. et al. (2001). Hypertension. 37, 449-455. Binetruy-Tournaire, R. et al. (2000). EMBO J.. 19, 1525-1533. Kragler, F. et al. (2000). EMBO J.. 19, 2856-2868. Gazouli, M. et al. (2002). J. Pharmacol. Exp. Ther.. 303, 627-632. Romanczuk, H. et al. (1999). Hum. Gene Ther.. 10, 2615-2626. Nicklin, S.A. et al. (2000). Circulation. 102, 231-237. Jost, P.J. et al. (2001). FEBS Lett.. 489, 263-269. Rasmussen, U.B. et al. (2002). Cancer Gene Ther.. 9, 606-612. Tinoco, L.W. et al. (2002). J. Biol. Chem.. 277, 36351-36356. Stratmann, J. et al. (2002). J. Clin. Microbiol.. 40, 4244-4250. Mourez, M. et al. (2001). Nat. Biotechnol.. 19, 958-961. Lee, L. et al. (2002). Arthritis Rheum.. 46, 2109-2120. Duerr, D.M. et al. (2004). J. Virol. Methods. 116, 177-180. Can a different bacterial strain be used with the Ph.D.™ Phage Display? No plaques are visible when titering using the Ph.D.™ Phage Display kit. I am using Ph.D.™ Phage display and the amplified phage titer is low. I am using Ph.D.™ Phage Display and the phage DNA templates do not yield readable sequence. I am using Ph.D.™ Phage Display and the sequencing templates do not run where they should on a gel. I am using Ph.D.™ Phage Display and after 4 or more rounds of panning all clones are wild-type phage (white plaques). When using the Ph.D.™ Phage Display, panning yielded a consensus sequence, but no ELISA signal. I am using Ph.D.™ Phage Display and the streptavidin control experiment did not yield the HPQ consensus sequence. Where can I find references for Ph.D.™ phage display libraries?